November 2013 Visa Bulletin - Gateway to Canada | Canada Immigration Consultancy! 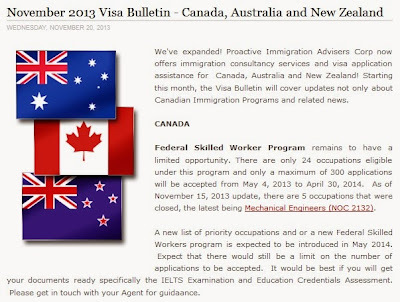 November 2013 Visa Bulletin is now out! Visa Bulletin is Proactive Immigrations Advisers Corp's monthly newsletter intended primarily for its clients. For the past few months, there wasn't any visa bulletin issued, as there is nothing much to update. Click the image below to read the visa bulletin. Starting this month, there will be a regular monthly newsletter and will not be limited to Canada related updates. It will also include updates about New Zealand and Australia.